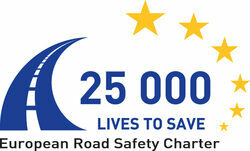 The European Road Safety Charter is much more than a policy document. It is an invitation by the European Commission to take concrete actions, assess results and further heighten awareness about the need to reduce road accident fatalities. The European Commission is playing a major role in the European-wide effort to make our roads safer. It wishes to afford all stakeholders (institutions, associations and companies) the opportunity to share ideas and practices across Europe, so that all stakeholders can learn from each other and gain inspiration as to how the road situation in Europe can be improved. In return the European Road Safety Charter offers European recognition to the associations that have signed up, and also makes the road safety actions they wish to carry out more visible on a European level. Upon signing the European Road Safety Charter, we help to build upon knowledge and to exchange good practices on road safety in Europe while adding a European dimension to our actions. From the moment we signed, we are considered to be road safety role models and are authorised to use the European Road Safety Charter label. Vehicle Safety: Innovation, safety devices, vehicle regulation policies. Infrastructure Safety: Safer road infrastructures, road safety impact assessment. User behaviour: Increased understanding, improved skills, strengthened attitudes. A reduction in the number of accidents. A reduction in damage to the environment through road safety action. A reduction in the cost of material damage (cars or roads). A reduction in loss of time due to road injuries. An improvement in public health through road safety action (e.g. reduction in drink driving). An increase in public attention to risk (e.g. road safety education). An increased sense of responsibility through training (e.g. campaign against uninsured drivers). Road safety is considered one of the key issues of Corporate Social Responsibility in companies today. CSR encompasses important corporate issues such as occupational safety and health. As 60% of fatal work accidents are road accidents, drastically reducing this figure is a primary concern for employers and employees in every industry, and every nation. The commitment should: be concrete, feasible and able to be monitored; contribute directly or indirectly to the goal of halving the number of road fatalities; go beyond what you are obliged to do by law; lie within the organisation's responsibility; involve a civil society group in its fulfilment (e.g. company, association, NGO, town council, institution etc. ).